We welcome your family to enjoy our cherry orchard! Come a hand-pick Rainier cherries, Bing cherries, and Skeena cherries. We guarantee pesticide free fruit so you can sample right off the tree. 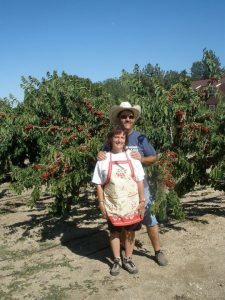 You can find our cherry orchard in Leona Valley, CA – about 12 miles west of Palmdale and a short drive from Santa Clarita. We also have Local Honey for sale, as well as our famous Cherry Lavender Sweet Tea. Your family will find farm animals and lots of fun photo props for the memories to take home. Our goal is for you to relax, enjoy the time here and leave feeling refreshed and saying, “I can’t wait to come back again”.